Unfortunately, I've been a bit under the weather so I haven't felt like putting together any rooms. I've started four scenes but none are finished. The one above is a partial scene that I will not finish. I'm such a quitter, ey? And by "quitter", I don't mean socks that loose their elasticity and creep down into your shoe. I hope that I'm back to 100% in the next few days and can finish the other set-ups. Also, I will respond to the emails that I've received. I got through most but have a few left to reply to. Let's see, um...Oh! 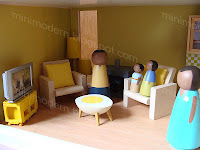 I got an email from someone thinking about producing an Eichler dollhouse---oops!, I mean "Eichler-esque" dollhouse which I assume means it will have a lot of mid-century modern goodness and remind you of Joseph's endeavors. No details about whether or not it will be a kit or ready-built. No word on cost and it's nothing that will be available in the next year. They want to remain completely anonymous--and who am I to question that? Really, who am I? Ha ha---God, that's just awfully corny. One more thing, I picked up some small lights from IKEA's new Solig summer inventory while buying the Virre bent plywood slide for my oldest... Uh oh! Time for an aside!---The Virre slide is so cute and actually looks like an elephant from the profile which makes you think of Eames. We are having a lot of fun with it...which might be the real reason why I haven't finished any mini scenes. It looks like we will be able to use the slide base as a table after the novelty of the slide wears off. It's been a good purchase so far. ...And I'm Back---so the lights are half domes, 1.5 to 2 inches in diameter and have watch batteries in them. They work well for the dollhouse whether you are using them as actual lights in the structure or around a pool scene or if you're using them as light to work and play by. They come in white, yellow and orange and cost $3.99 for a pack of three. Oh! An Eichler-esque dollhouse would be wonderful. The other day the NYT featured a Eichler house in their "What you get for . . . " column - gorgeous. Have you seen the dollhouse on ebay that is a MARX IMAGINATION 1965 VINTAGE DOLL HOUSE -Very Rare, item #290302494045? Very unusual. Take care of yourself -- buy lots of tissues. Thanks for the tip on the IKEA lights! Hope you get well soon, too! Wishing you a quick recovery. Um, so, did you eat the table afterwards? Yes, I have seen the Marx Imagination house. I've never been much a fan of it though. Actually, I never liked the plastic furniture that went with it. It's all one color and lacks details other than an impression. 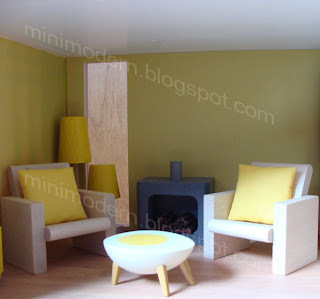 However, almost all other modern dollhouse enthusiasts do love that house. asusual looking great... just wanted to let you know that I think Reac is coming out with a new series of chairs, check out the Entertainment Earth website... a Barcelona daybed is included! The tree lights from Ikea are very nice. How long will the batteries last? Which Ikea you bought these from? Here in Finland I cannot find these. They are watch batteries and so they last a pretty decent amount of time. I've left a few on overnight and they still light up great. I bought these from Emeryville CA store.